Metal spring clamps with soft-grip pads. Low-cost wrap-around protection with one-piece, polycarbonate lens. CE approved. Meets ANSI Z87.1 standards. Lightweight; wraparound design; meets the requirements of ANSI Z87.1-2003. Designed for one hand use. Soft, pliable pads protect fine finishes. Constructed from the same high-tech resin material as Quick-Grip bar clamps, strong, lightweight and rust resistant. Jaw contoured to hold round and odd-shaped objects. Handles designed for comfortable hand span. Offers maximum comfort without sacrificing safety. High-impact lenses protects against flying debris and direct side ventilation helps reduce fogging. Clear vinyl body fits snug to the face. Fits comfortably over most prescription glasses. Made with 100 percent virgin materials which improves the clarity of the material, as well as the strength. Features indirectly vented side temples to help keep the users cool; fit over most prescription eyewear to protect from impact. Used in applications such as power tool work sawing/drilling in metal or wood, hammering, painting or overhead work. Meet the high impact requirements of the American National Standards Institute's ANSI Z87.1-2010 standard. PVC tips and heavy duty springs on a heavy gauge metal frame. This flexible, stretchable strap is designed to keep glasses tight to the face without amy hanging leash and is compatible with most Edge Eyewear styles. Metal spring clamps with soft-grip pads. Wrap around lens design fits over most prescription eyeglasses; ANSI certified. Designed for one hand use. Soft, pliable pads protect fine finishes. Constructed from the same high-tech resin material as Quick-Grip bar clamps, strong, lightweight and rust resistant. Jaw contoured to hold round and odd-shaped objects. Handles designed for comfortable hand span. The blade-style Banraj has a lightweight, economical frame equipped with soft TPR nose pads and temple tips to create a comfortable, nonslip fit. This single-piece lens has no lower frame to obstruct sight. Edge Eyewear is ANSI Z87.1+2015 and Military Ballistic MCEPS GL-PD 10-12 compliant and all lenses block 99.9% of UV radiation. Soft, vinyl frame-replaceable clear lens. Always wear goggles when using hand tools to protect your eyes. For use in reading project instructions, seeing detail sanding/cutting work or woodworking activities. Molded-in 2.0 diopter bifocal lenses are out of line of sight when not looking down. Soft molded-in rubber temples help keep glasses comfortably secure. Anti-fog lenses help maintain clear vision. Meets American National Standards Institute's ANSI Z87.1-2003 standard. Sleek and lightweight style. One-piece polycarbonate front with adjustable temples. Wrap-around protection. CSA approved available. Meets ANSI Z87.1 standards and base curve = 8. Sleek and lightweight style. One-piece polycarbonate front with adjustable temples. Wrap-around protection. CSA approved available. Meets ANSI Z87.1 standards and base curve = 8. Chemical splash goggle protects from dust, splash and fumes .060 polycarbonate lens. Unique pivoting jaw ends provide secure, even gripping without work surface damage. Rust resistant light weight resin construction. Metal spring clamps with soft-grip pads. Vent holes on the brow guard help keep the user comfortable as does the adjustable temple length. The anti fog lens helps ensure that the wearer will have an unobstructed view when working in applications such as power tool work sawing/drilling in metal or wood, hammering or overhead work. Meets the high impact requirements of the American National Standards Institute's ANSI Z87.1-2010 standard. Sleek and lightweight style. One-piece polycarbonate front with adjustable temples. Wrap-around protection. CSA approved available. Meets ANSI Z87.1 standards and base curve = 8. Anti-scratch lens coating helps prevent scratching; lightweight, comfortable unobstructed protection; impact resistant lenses absorb 99.9 percent UV; meets requirements of ANSI Z87.1-2003. Outdoor gray lenses; wraparound lens fits close to face for added protection; anti-scratch lens coating helps prevent scratching; lightweight, comfortable unobstructed protection; impact resistant lenses absorb 99.9% UV; meets requirements of ANSI Z87.1-2003. Designed for one hand use. Soft, pliable pads protect fine finishes. Constructed from the same high-tech resin material as Quick-Grip bar clamps, strong, lightweight and rust resistant. Jaw contoured to hold round and odd-shaped objects. Handles designed for comfortable hand span. TEKK Protection Project Safety Kit, 3 Pieces, Includes: TEKK Protection 8200 Sanding and Fiberglass Respirator, Splash/Impact Goggles, Corded Reusable Earplugs, 25 dB, N95, ANSI Z87.1, CSA Z94.3, For Do-It-Yourself and Homeowner Applications Lightweight; wraparound design; meets the requirements of ANSI Z87.1-2003. Lightweight; wraparound design; meets the requirements of ANSI Z87.1-2003. Lightweight glasses wrap closely to the head and flex to fit both large and small head sizes well. An anti-scratch lens coating reduces lens abrasion during normal usage. Meets American National Standards Institute's ANSI Z87.1-2003 standard. This combo kit contains nitrile gloves and impact resistant goggles, making it ideal for applications such as apply pesticides, stripping wood and painting. Wrap around lens contours to face for great fit. Soft, comfortable dual shot plastic/rubber temples for retention. Soft rubber nose pads reduces slippage on face. Used in power tool work, sawing, drilling and for protection from flying chips and debris. Use to replace broken or cracked faceshield covers; designed to fit the patented 3M TEKK protection deluxe and professional faceshield systems; made of a pre-molded clear polycarbonate; high in strength; meets the ANSI Z87.1-2009/CSA Z94.3-2005 requirements. High-impact polycarbonate clear visor; use with 895.9751. Tough, polycarbonate lens provides impact resistance with 10 base curve lens provides maximum coverage and protection. Rubber tipped temples provide a secure comfortable fit. Soft, rubber nosepiece provides non-slip, comfortable wear. Tough, polycarbonate lens provides impact resistance with 10 base curve lens provides maximum coverage and protection. Rubber tipped temples provide a secure comfortable fit. Soft, rubber nosepiece provides non-slip, comfortable wear. Lightweight glasses wrap closely to the head and flex to fit both large and small head sizes well. An anti-scratch lens coating reduces lens abrasion during normal usage. Meets American National Standards Institute's ANSI Z87.1-2003 standard. Features popular tinted and clear models; stylish and lightweight; meets requirements for OSHA and ANSI High Impact. Tough, polycarbonate lens provides impact resistance with 10 base curve lens provides maximum coverage and protection. Rubber tipped temples provide a secure comfortable fit. Soft, rubber nosepiece provides non-slip, comfortable wear. Over-the-glass safety glasses with anti-scratch coating combines safety with value by providing functional protection. They fit over most prescription safety glasses but can also be worn as regular safety glasses. Slim, lightweight protective eyewear; dual mold rubber temples provide a secure, comfortable fit; polycarbonate lens provides impact resistance; soft, rubber nosepiece offers maximum all-day comfort; meets Z87.1 ANSI, UVA and UV8 99.9 percent protection. Slim, lightweight protective eyewear; dual mold rubber temples provide a secure, comfortable fit; polycarbonate lens provides impact resistance; soft, rubber nosepiece offers maximum all-day comfort; meets Z87.1 ANSI, UVA and UV8 99.9 percent protection. Rubber tipped temples provide a non-slip comfortable fit. Full frame with larger lens provides excellent coverage. Integrated rubber nosepiece for longer, comfortable wear. Rubber brow and nose bridge and translucent polycarbonate materials combine for user comfort and protection. Ratchet adjustable temples for custom fit, Anti-fog lens for unobstructed vision; anti-scratch lens coating. Soft, dual-shot temple ends for a comfortable secure fit. Meets American National Standards Institute's ANSI Z87.1-2003 standard. 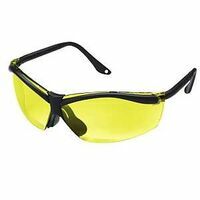 3M Safety Eyewear, Semi-Rimless, Yellow Lens, Anti-Scratch Lens Coating, Black Frame, Adjustable Temple, ANSI Z87.1, OSHA Approved 3M Safety Eyewear, Sports Inspired, Clear Lens, Anti-Fog? Lens Coating, Wraparound Frame, Black Frame, Adjustable Temple, ANSI Z87.1-2003, CSA Z94.3-2007, For Sports High impact resistant lenses with anti-scratch coating; soft, comfortable nose piece; flat temples provide a comfortable fit with earmuffs; lenses absorb 99% UV. Meets requirements of ANSI Z87.1. High impact resistant lenses; soft, comfortable nosepiece; lenses absorb up to 99.9% of UV, UVA and UVB radiation; meets ANSI Z87.1-2010 requirements. High impact resistant lenses with anti-scratch coating; soft, comfortable nose piece; flat temples provide a comfortable fit with earmuffs; lenses absorb 99% UV. Meets requirements of ANSI Z87.1. Ideal for indoor projects. Offers excellent protection for those who wear prescription eyewear. Tough polycarbonate lenses for impact resistance; indirect vent ports prevent liquids from reaching eyes; protection against impact and paint spray, liquid splash, flying chips and dust particles. Meets ANSI Z87.1-2010 and OSHA regulations. Adjustable lens angle. Dual shot injected temple ends create secure fit. Comfortable rubber nosepiece and temple. Meets the impact protector requirements of ANSI/ISEA Z87.1-2010 and meets the OSHA eye protection standards. The Dakura's flexible and durable black frame is equipped with soft TPR temple arms to create a comfortable, nonslip fit. Edge Eyewear is ANSI Z87.1+2015 and Military Ballistic MCEPS GL-PD 10-12 compliant and all lenses block 99.9% of UV radiation. The blade-style Zorge G2 has a flexible and durable black frame equipped with soft TPR nose pads and temple arms to create a comfortable, nonslip fit. The magnification readers are perfect for intricate work and viewing fine details. Edge Eyewear is ANSI Z87.1+2015 and Military Ballistic MCEPS GL-PD 10-12 compliant and all lenses block 99.9% of UV radiation. The blade-style Zorge G2 has a flexible and durable black frame equipped with soft TPR nose pads and temple arms to create a comfortable, nonslip fit. The magnification readers are perfect for intricate work and viewing fine details. Edge Eyewear is ANSI Z87.1+2015 and Military Ballistic MCEPS GL-PD 10-12 compliant and all lenses block 99.9% of UV radiation. The Dakura's flexible and durable forest camouflage frame is equipped with soft TPR temple arms to create a comfortable, nonslip fit. Edge Eyewear is ANSI Z87.1+2015 and Military Ballistic MCEPS GL-PD 10-12 compliant and all lenses block 99.9% of UV radiation. "Max-Dri" Moisture Wicking Mesh Technology; Birdseye Mesh allows for maximum breathability; Pockets: 1 upper left front; Materials: 100% Wicking Polyester Mesh. Larger lens for more complete wrap around protection. Precise placement of inserts allows for distortion-free forward vision and increased safety when wearing. Enhanced nose piece design with integrated ridges to channel away sweat. Meets CSA. Includes: Free neck cord. Larger lens for more complete wrap around protection. Precise placement of inserts allows for distortion-free forward vision and increased safety when wearing. Enhanced nose piece design with integrated ridges to channel away sweat. Meets CSA. Includes: Free neck cord. Larger lens for more complete wrap around protection. Precise placement of inserts allows for distortion-free forward vision and increased safety when wearing. Enhanced nose piece design with integrated ridges to channel away sweat. Meets CSA. Includes: Free neck cord. High performance ratchet headband. Crown assembly pivots up. Low-riding nape strap for firm fit. CSA approved. The Dakura's flexible and durable forest camouflage frame is equipped with soft TPR temple arms to create a comfortable, nonslip fit. Edge Eyewear is ANSI Z87.1+2015 and Military Ballistic MCEPS GL-PD 10-12 compliant and all lenses block 99.9% of UV radiation. Tough, polycarbonate lens is impact resistant and 99.9 percent UV protection. Distortion free lens provides fatigue free use. Full wraparound, rugged frame design fits securely. Rubber tipped temples keeps glass securely in place. Soft, rubber non-slip nosepiece provides maximum all day comfort. Features a wraparound contemporary frame. The tinted anti-fog lenses with maximum UV protection provide the ultimate in eye protection. Comfortable rubber nosepiece and temple. Slim fit style. Standards: ANSI Z87.1+2010; MCEPS GL-PD 10-12. UV Protection: 99.999% UVA/UVB. Polycarbonate lens material. Scratch-resistant lens coating. Heavy duty 8" wide elastic back panel and 5" side band for custom fit. 1-1/4" wide adjustable suspenders, 4 iinternal stays provide extra support. Tapered front panels for comfort while bending. Lightweight for all day wear, full side and brow protection, soft nosepiece for added comfort, polycarbonate lens provides 99.9 percent UV protection and meets ANSI Z87.1 and CSA Z94.3 safety standards. The sleek Reclus has a flexible and durable black frame equipped with soft TPR nose pads and temple tips to create a comfortable, nonslip fit. Silver accents on each temple add additional style to this classic design. Edge Eyewear is ANSI Z87.1+2015 and Military Ballistic MCEPS GL-PD 10-12 compliant and all lenses block 99.9% of UV radiation. The sleek Reclus has a flexible and durable black frame equipped with soft TPR nose pads and temple tips to create a comfortable, nonslip fit. Silver accents on each temple add additional style to this classic design. Edge Eyewear is ANSI Z87.1+2015 and Military Ballistic MCEPS GL-PD 10-12 compliant and all lenses block 99.9% of UV radiation. The sleek Reclus has a flexible and durable black frame equipped with soft TPR nose pads and temple tips to create a comfortable, nonslip fit. Silver accents on each temple add additional style to this classic design. Edge Eyewear is ANSI Z87.1+2015 and Military Ballistic MCEPS GL-PD 10-12 compliant and all lenses block 99.9% of UV radiation. The blade-style Khor has a flexible and durable black frame equipped with soft TPR nose pads and temple arms to create a comfortable, nonslip fit. The open lower frame prevents sight obstruction and allows lenses to be replaced easily. Edge Eyewear is ANSI Z87.1+2015 and Military Ballistic MCEPS GL-PD 10-12 compliant and all lenses block 99.9% of UV radiation. The blade-style Khor has a flexible and durable black frame equipped with soft TPR nose pads and temple arms to create a comfortable, nonslip fit. The open lower frame prevents sight obstruction and allows lenses to be replaced easily. Edge Eyewear is ANSI Z87.1+2015 and Military Ballistic MCEPS GL-PD 10-12 compliant and all lenses block 99.9% of UV radiation. 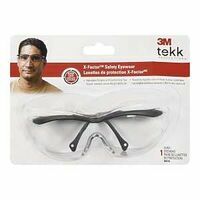 Reduces eye exposure to dust and debris; removable foam gasket. Meets requirements of ANSI Z87.1-2015. Made with "Max-Dri" Moisture Wicking Mesh Technology allowing for maximum breathability without compromising durability; the stripes are adhered by heat transfer rather than sewn on making the safety T-shirt wear much like a regular T-shirt; the front pocket does not include reflective material to allow for corporate imprints; 2" heat transfer reflective tape, 1 horizontal stripe; Materials: 100% Wicking Polyester Mesh; 25 wash maximum; 3rd party certified - meets ANSI/ISEA 107-2010 standards. Made with "Max-Dri" Moisture Wicking Mesh Technology allowing for maximum breathability without compromising durability; the stripes are adhered by heat transfer rather than sewn on making the safety T-shirt wear much like a regular T-shirt; the front pocket does not include reflective material to allow for corporate imprints; 2" heat transfer reflective tape, 1 horizontal stripe; Materials: 100% Wicking Polyester Mesh; 25 wash maximum; 3rd party certified - meets ANSI/ISEA 107-2010 standards. Made with "Max-Dri" Moisture Wicking Mesh Technology allowing for maximum breathability without compromising durability; the stripes are adhered by heat transfer rather than sewn on making the safety T-shirt wear much like a regular T-shirt; the front pocket does not include reflective material to allow for corporate imprints; 2" heat transfer reflective tape, 1 horizontal stripe; Materials: 100% Wicking Polyester Mesh; 25 wash maximum; 3rd party certified - meets ANSI/ISEA 107-2010 standards. Made with "Max-Dri" Moisture Wicking Mesh Technology allowing for maximum breathability without compromising durability; the stripes are adhered by heat transfer rather than sewn on making the safety T-shirt wear much like a regular T-shirt; the front pocket does not include reflective material to allow for corporate imprints; 2" heat transfer reflective tape, 1 horizontal stripe; Materials: 100% Wicking Polyester Mesh; 25 wash maximum; 3rd party certified - meets ANSI/ISEA 107-2010 standards. Impact and scratch-resistant lenses feature an anti-fog coating; provides 99% U protection; contains eyewear, bag and lanyard. Meets requirements of ANSI Z87.1-2015. Impact and scratch-resistant lenses feature an anti-fog coating; provides 99% U protection; contains eyewear, bag and lanyard. Meets requirements of ANSI Z87.1-2015. Protects face and neck against chemical splash and flying particles; crown protector is made of a high strength thermoplastic material impact resistant over a wide range of temperatures; window is made of tough polycarbonate and provides good heat resistance; meets ANSI Z87.1-1989 and complies with OSHA requirements. Soft-touch nose and ear pieces; lightweight for comfortable, extended use; scratch-resistant, anti-fog coating; impact-resistant lenses absorb 99.9% of UV radiation; includes drawstring bag and lanyard; meets requirements of ANSI Z87.1. Soft-touch nose and ear pieces; lightweight for comfortable, extended use; scratch-resistant, anti-fog coating; impact-resistant lenses absorb 99.9% of UV radiation; includes drawstring bag and lanyard; meets requirements of ANSI Z87.1. Impact and scratch-resistant lenses feature an anti-fog coating; provides 99% U protection; contains eyewear, bag and lanyard. Meets requirements of ANSI Z87.1-2015. Flexible and resilient frames for a customizable fit; multi-injection technology fuses lens to the frame; impact-resistant lenses absorb 99.9 percent UV, UVA and UVB. The Brazeau's flexible and durable frame has foam nose pads that make these glasses easy to wear all day. Recessed lens cavities prevent airflow from drying out the eyes. Edge Eyewear is ANSI Z87.1+2015 and Military Ballistic MCEPS GL-PD 10-12 compliant and all lenses block 99.9% of UV radiation. The blade-style Zorge G2 has a flexible and durable black frame equipped with temple arms to create a comfortable, nonslip fit. The open lower frame prevents sight obstruction and allows lenses to be replaced easily. Edge Eyewear is ANSI Z87.1+2015 and Military Ballistic MCEPS GL-PD 10-12 compliant and all lenses block 99.9% of UV radiation. The blade-style Zorge G2 has a flexible and durable black frame equipped with temple arms to create a comfortable, nonslip fit. The open lower frame prevents sight obstruction and allows lenses to be replaced easily. Edge Eyewear is ANSI Z87.1+2015 and Military Ballistic MCEPS GL-PD 10-12 compliant and all lenses block 99.9% of UV radiation. The Brazeau's flexible and durable frame has foam nose pads that make these glasses easy to wear all day. Recessed lens cavities prevent airflow from drying out the eyes. Edge Eyewear is ANSI Z87.1+2015 and Military Ballistic MCEPS GL-PD 10-12 compliant and all lenses block 99.9% of UV radiation. The Brazeau's flexible and durable frame has foam nose pads that make these glasses easy to wear all day. Recessed lens cavities prevent airflow from drying out the eyes. Edge Eyewear is ANSI Z87.1+2015 and Military Ballistic MCEPS GL-PD 10-12 compliant and all lenses block 99.9% of UV radiation. The Brazeau Skull's flexible and durable black frame features a winged skull on each temple and has foam nose pads that make these glasses easy to wear all day. Recessed lens cavities prevent airflow from drying out the eyes. Edge Eyewear is ANSI Z87.1+2015 and Military Ballistic MCEPS GL-PD 10-12 compliant and all lenses block 99.9% of UV radiation. Worn to help protect eyes against particles and airborne debris; wraparound frame design; anti-scratch lens coating; impact-resistant lenses absorb up to 99.9% UV; meets the requirements of ANSI Z87.1-2010; weighs less than 1 ounce. Durable lenses help provide limited protection from light to moderate impact hazards. Lightweight, durable design for comfort and lasting use. Scratch-resistant lenses help keep vision clear. Impact-resistant lenses block 99.9% of UV rays. Includes a handy storage bag and lanyard to help prevent damage and loss. Meets the requirements of ANSI Z87.1, CSA Z94.3 and AS/NZS 1,337. Lenses help reduce glare and are popular for inside and outside environments. Made with "Max-Dri" which is an arid Birdseye Moisture Wicking Mesh allowing or maximum breathability without compromising durability; the stripes are adhered by heat transfer rather than sewn on making the safety T-shirt wear much more like a regular T-shirt; the wicking properties improve hot weather comfort making it feel much cooler; the front pocket does not include reflective material to allow for corporate imprints; 2" heat transfer reflective tape: 1 horizontal stripe on torso, 2 horizontal stripes on arms; Materials: 100% Polyester Birds-eye Mesh; 25 wash max; 3rd party certified - meets ANSI/ISEA 107-2010 standards. Made with "Max-Dri" which is an arid Birdseye Moisture Wicking Mesh allowing or maximum breathability without compromising durability; the stripes are adhered by heat transfer rather than sewn on making the safety T-shirt wear much more like a regular T-shirt; the wicking properties improve hot weather comfort making it feel much cooler; the front pocket does not include reflective material to allow for corporate imprints; 2" heat transfer reflective tape: 1 horizontal stripe on torso, 2 horizontal stripes on arms; Materials: 100% Polyester Birds-eye Mesh; 25 wash max; 3rd party certified - meets ANSI/ISEA 107-2010 standards. Made with "Max-Dri" which is an arid Birdseye Moisture Wicking Mesh allowing or maximum breathability without compromising durability; the stripes are adhered by heat transfer rather than sewn on making the safety T-shirt wear much more like a regular T-shirt; the wicking properties improve hot weather comfort making it feel much cooler; the front pocket does not include reflective material to allow for corporate imprints; 2" heat transfer reflective tape: 1 horizontal stripe on torso, 2 horizontal stripes on arms; Materials: 100% Polyester Birds-eye Mesh; 25 wash max; 3rd party certified - meets ANSI/ISEA 107-2010 standards. Made with "Max-Dri" which is an arid Birdseye Moisture Wicking Mesh allowing or maximum breathability without compromising durability; the stripes are adhered by heat transfer rather than sewn on making the safety T-shirt wear much more like a regular T-shirt; the wicking properties improve hot weather comfort making it feel much cooler; the front pocket does not include reflective material to allow for corporate imprints; 2" heat transfer reflective tape: 1 horizontal stripe on torso, 2 horizontal stripes on arms; Materials: 100% Polyester Birds-eye Mesh; 25 wash max; 3rd party certified - meets ANSI/ISEA 107-2010 standards. Includes 4 pairs; designed with polycarbonate lenses; lenses absorb 99.9% UV; meets the requirements of ANSI Z87.1-2010. The sleek Reclus has a flexible and durable black frame equipped with soft TPR nose pads and temple tips to create a comfortable, nonslip fit. Silver accents on each temple add additional style to this classic design. Edge Eyewear is ANSI Z87.1+2015 and Military Ballistic MCEPS GL-PD 10-12 compliant and all lenses block 99.9% of UV radiation. Worn to help protect eyes against particles and airborne debris; durable, vented temples; adjustable nosepiece; anti-scratch coating; impact-resistant lenses absorb 99.9% UV; includes hard shell storage case; meets ANSI Z87.1-2003 standards. Streamline geometry with vented torsion lock temples for head hugging fit; meets or exceeds ANSI Z87.1 industrial safety standards; triple reflex coated for scratch resistance and extreme 99.9% UV protection; carrying case. Durable lenses help provide limited protection from light to moderate impact hazards. Lightweight, durable design for comfort and lasting use. Scratch-resistant lenses help keep vision clear. Impact-resistant lenses block 99.9% of UV rays. Includes a handy storage bag and lanyard to help prevent damage and loss. Meets the requirements of ANSI Z87.1, CSA Z94.3 and AS/NZS 1,337. Lenses help reduce glare and are popular for inside and outside environments. Polarized, tinted lenses help reduce glare reflected off of shiny surfaces such as snow, water sand and pavement. These safety glasses also offer 99.999 percent UV protection (UV 400). Stylish, tight-wrap design and soft rubber nosebridge. Safety glasses meet the Impact Protector requirements of ANSI/ISEA Z87.1-2010 and OSHA eye protection standards. The Dakura's flexible and durable black frame is equipped with soft TPR temple arms to create a comfortable, nonslip fit. The addition of a polarizing lens filter increases clarity by reducing glare. Edge Eyewear is ANSI Z87.1+2015 and Military Ballistic MCEPS GL-PD 10-12 compliant and all lenses block 99.9% of UV radiation. The blade-style Khor has a flexible and durable black frame equipped with soft TPR nose pads and temple arms to create a comfortable, nonslip fit. The open lower frame prevents sight obstruction and allows lenses to be replaced easily. Edge Eyewear is ANSI Z87.1+2015 and Military Ballistic MCEPS GL-PD 10-12 compliant and all lenses block 99.9% of UV radiation. The blade-style Khor has a flexible and durable black frame equipped with soft TPR nose pads and temple arms to create a comfortable, nonslip fit. The open lower frame prevents sight obstruction and allows lenses to be replaced easily. Edge Eyewear is ANSI Z87.1+2015 and Military Ballistic MCEPS GL-PD 10-12 compliant and all lenses block 99.9% of UV radiation. Lightweight design. Sleek, popular styling with an economical price. Universal nosebridge for comfort and fit. Meets ANSI Z87.1+ Standards. 99.9 percent UV protection. Base curve: 9.5. Lightweight design. Sleek, popular styling with an economical price. Universal nosebridge for comfort and fit. Meets ANSI Z87.1+ Standards. 99.9 percent UV protection. Base curve: 9.5. The Brazeau's flexible and durable frame has foam nose pads that make these glasses easy to wear all day. Recessed lens cavities prevent airflow from drying out the eyes. Edge Eyewear is ANSI Z87.1+2015 and Military Ballistic MCEPS GL-PD 10-12 compliant and all lenses block 99.9% of UV radiation. The Brazeau's flexible and durable frame has foam nose pads that make these glasses easy to wear all day. Recessed lens cavities prevent airflow from drying out the eyes. Edge Eyewear is ANSI Z87.1+2015 and Military Ballistic MCEPS GL-PD 10-12 compliant and all lenses block 99.9% of UV radiation. The Brazeau's flexible and durable frame has foam nose pads that make these glasses easy to wear all day. Recessed lens cavities prevent airflow from drying out the eyes. Edge Eyewear is ANSI Z87.1+2015 and Military Ballistic MCEPS GL-PD 10-12 compliant and all lenses block 99.9% of UV radiation. The Brazeau's flexible and durable frame has foam nose pads that make these glasses easy to wear all day. Recessed lens cavities prevent airflow from drying out the eyes. Edge Eyewear is ANSI Z87.1+2015 and Military Ballistic MCEPS GL-PD 10-12 compliant and all lenses block 99.9% of UV radiation. For use whenever quick clamping and light pressure is required. Assorted neon colors, Do Not Specify Colors. Durable lenses help provide limited protection from light to moderate impact hazards. Lightweight, durable design for comfort and lasting use. Scratch-resistant lenses help keep vision clear. Impact-resistant lenses block 99.9% of UV rays. Includes a handy storage bag and lanyard to help prevent damage and loss. Meets the requirements of ANSI Z87.1, CSA Z94.3 and AS/NZS 1,337. Lenses help reduce glare and are popular for inside and outside environments. This black nylon cord is adjustable for a tight fit. The nylon tips fit all Edge Eyewear styles. This black and gray rope leash has an adjustable back for a tight fit. The neoprene tips fit all Edge Eyewear styles. This black stretchable sleeve is adjustable sleeve is adjustable for a tight fit and is compatible with all Edge Eyewear styles. Polarized lenses with anti-scratch coating; grooved two-tone design; adjustable nose bridge; dual-molded temples; includes microfiber storage bag and lanyard absorbs 99.9% of UV rays; meets ANSI Z87.1-2003 and OSHA standards. For household, camping, shop and professional tool box. Rust resistant, lightweight and easy to use. Self-adjusting jaw ends. For household, camping, shop and professional tool box. Rust resistant, lightweight and easy to use. Self-adjusting jaw ends. Transparent with white elastic strap. Provides 99.9 percent UV protection; features: soft rubber nosepiece with flared ends and soft, rubber temples; includes neck cord; lenses are hard coated for scratch resistance; meets ANSI Z87.1 safety standards. Sleek and lightweight style. One-piece polycarbonate front with adjustable temples. Wrap-around protection. CSA approved available. Meets ANSI Z87.1 standards and base curve = 8. Provides 99.9 percent UV protection; features: soft rubber nosepiece with flared ends and soft, rubber temples; includes neck cord; lenses are hard coated for scratch resistance; meets ANSI Z87.1 safety standards. Sleek, sporty style with soft touch temples. Light weight construction and single lens wrap-around protection. 99.9 percent UV protection. Meets ANSI Z87.1+ standards. Sleek, sporty style with soft touch temples. Light weight construction and single lens wrap-around protection. 99.9 percent UV protection. Meets ANSI Z87.1+ standards. Sleek, sporty style with soft touch temples. Light weight construction and single lens wrap-around protection. 99.9 percent UV protection. Meets ANSI Z87.1+ standards. This floater cord is designed to keep glasses close to the face without a hanging leash.